I did not realize our squadron patch and emblem are slightly different, the font is changed and the Latin scroll is moved. It is a big patch 4in round, it takes up most of the pocket on the BDU's and looks HUGE on the flightsuit. I think it is the best looking patch I have had in any of my squadrons. The unit number is different as well. One could make hay that these are not the same insignia and therefore one or the other isn't actually approved for wear. I was originally going to note that you'd never be able to get the script on a patch that small and have it be legible. They also spelled "squadron" wrong on the patch. <_< I knew better, and I STILL fell for it! Because I am a rebel! Usually I'm wearing my ARM patch but it's not like my pen pocket patches are legal either. Edit: Removed question....it's probably worthy of a new thread. I think its an outstanding looking piece of electronic art but it is WAY too busy for a patch even one as big as it is. Some Wings have supplements which allow unit insignia to be worn as one of the optional patches. Minor Derail - You wouldn't happen to know which wings would you? You can add South Dakota Wing to that list. As you may (or may not) have noticed in prior discussions, I am a BIG fan of unit names. Here in CAWG, the predominance is for unit numbers, and is distresses me to no end. Podunk Cadet Squadron is much more friendly than Squadron 26, and gives a local reference. When someone says Big Bear, or Huntington Beach, or Fresno, or most any other location in California, it's easy to figure out where they are located. The squadrons with people's names are a bit harder, but are still better, IMHO, that a string of numbers. Getting back to the patch, using OKLA CITY COMP SQ conveys more about the unit than SWR-OK-113, which sounds like it could be a part number for an aircraft part just as well as it could be a unit identifier. I'm a fan of the numbers....but I understand what you are getting at. If we are going to go with names....I would mandate it to geographical names. Nellis Composite Squadron or South Bend Upper two thirds of the Eastern side of the Colorado River Composite Squadron is a lot better then the Hommer J. Simpson, MMMMM Doughnuts, Memorial Senior Squadron! Well, I can show you one of the worst ones. This is my old squadron when I first rejoined CAP. They actually had a nice one that a few people at NESA asked if they could get one for their collection. Anyway, this is their new design. I should put design in quotes for obvious reasons. There's nothing "old-skool" about that patch, my friend. this be ours... think what you will. BTW, if all you see is a hyperlink, but still wish to view it, C&P it into the little bar that takes web addresses. 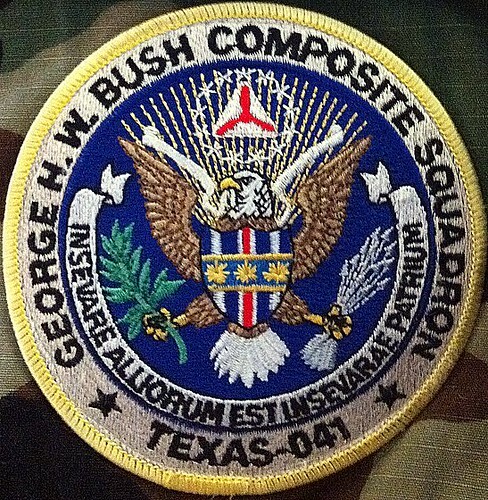 There was no movement or action to make a universal wing patch during the former Commander's tenure. Yeah, this. I had heard of the patch design being pushed to be nationwide, and was killed when he got booted. Never saw a document related to it though, so it was either a rumor or something else non-official. It was one of Penada... Penyada, however you spell it's ideas, and he tried it out on Florida, dunno why, Just happened. An Ex-Florida Wing Director of Cadet Programs told me about this happening during his term. But now he's better off in Colorado so it doesnt matter anymore! I know you well enough now Mr. EClispse that an Ex Director of Cadet Programs isnt going to be a hard enough cite for you, and you want to see some documentation, but I'm sorry, thats the best I can do for you... Hope you like? You are correct, some off-handed comment by a former random wing-staffer has no weight in something you are purporting to have been a national initiative. It isn't even a staffer who would be involved in that wing's insignia, let alone one for the whole organization. BTW, I'm just curious, this forum wasn't about who had what plan for what wing patches and who's right about what. 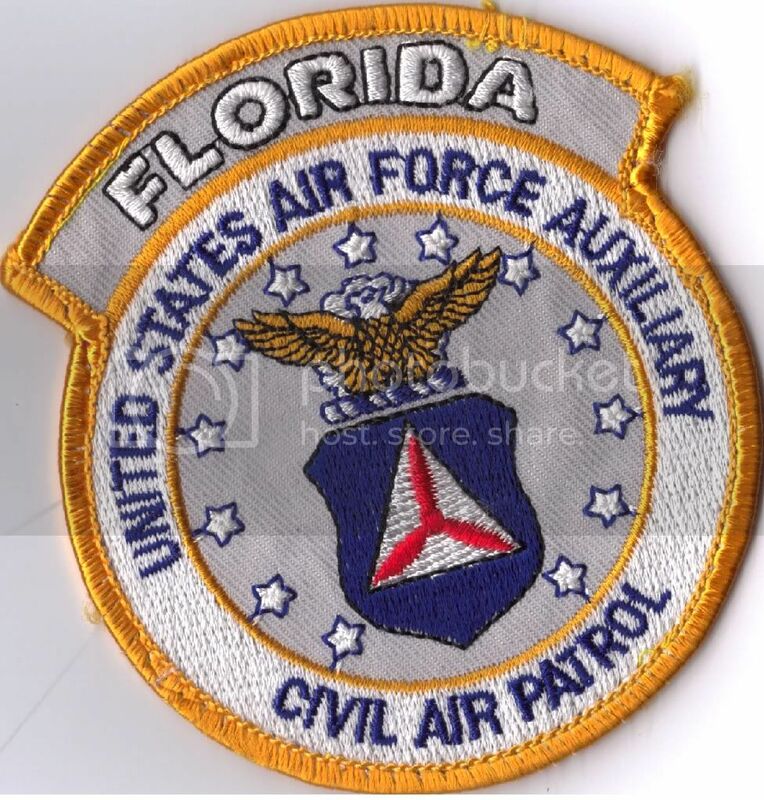 Someone had posted florida's patch, and I figured that a Wing Director of Cadet Programs who was serving in that position at the time of their wings patch change, would know a thing or two about why they changed it, so i commented on the photo. It made since to me. And I'm not the only one who has heard that either. But my bigest question of all (because I've seen your posts in every other forum)... Do you go around asking people to cite them selfs on everything? Is that your purpose in life? You have to understand here sir, that not EVERYTHING is written down on public documents for everyone to see. Especially if its just an 'idea.' Going "by the book" is good, and that is how it should be, but what happens when you run into contradictions or blanks, or loop holes? Then what? Sure most things are and should be in writing on record, but the reality is, not everything is, and it is then, and only then, can a good leader be measured for their inturpritation skills. I applaud you for your dedication to knowledge and being aware of regulations history and manuals etc, I wish everyone were like that, Its a hard skill to develope, and your knowledge is impressive. But when it comes down to it, sometimes you just gotta let things go.